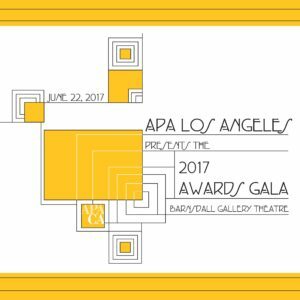 Join APA Los Angeles for our 2017 Awards Gala at the Barnsdall Gallery Theatre in East Hollywood, celebrating the best of planning in the Los Angeles area! This annual soiree recognizes the exceptional efforts being carried out by urban planners, advocates, elected officials and others to make great communities happen. It is a gathering of our region’s most active and innovative urban planning professionals, including professionals from cities, agencies, non-profits, and consulting firms. This year, we’re excited to have as our keynote speaker Christopher Hawthorne, Architecture Critic for the Los Angeles Times and thought leader on Los Angeles urbanism. Please join us for exclusive tours of Frank Lloyd Wright’s Hollyhock House and a discussion of its historic significance, a hosted bar and hors d’ouevres before the ceremony, followed by a celebratory reception and the Young Planner’s Group after-party! By Rail: Take the Metro Red Line to the Vermont/Sunset Station, cross Vermont and walk north about 1/2 block. Turn into the alley. About 100 feet in there is a set of stairs leading up to the southeast corner of the park. The accessible entrance is on the northside of the park, through the vehicle entrance on Hollywood Blvd. By Car: Parking is available on-site on a first come basis. Access the parking lot off Hollywood Blvd., parallel parking is also available throughout the park. Street parking is available on surrounding public streets. Take the Red Line to the Vermont/Sunset Station By car: Parking is available throughout Barnsdall Art Park. Metered street parking and Metro bus service are also available.